After two pieces of circumstantial evidence have been eliminated we should now take a closer look at the objects themselves. First we will take a look at the technical interpretation the authors prefer. 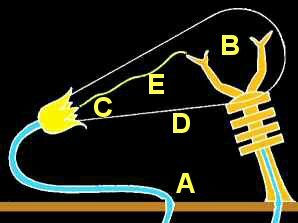 "If we evacuate a glass bulb with two metal parts (B), ( C) reaching into it we can see a discharge at much lower voltage levels, depending on the size of the glass balloon (D). At a pressure of about 40 Torr (antiquated measure for atmospheric pressure, FD) (40 mm of mercury) a snakelike light filament meanders from one metal part to the other (E). If we evacuate further, the light filament grows wider until it fills the whole glass balloon. This is exactly what we see in on the pictures in the subterranean chambers of the Hathor sanctuary." Why did Garn think that the relief shows a lamp? He, like many ancient astronaut ideologists, works with the popular “looks like”-method. This works like “Looks to me like a lamp / spaceship / helicopter, so it is”. This method is based on the assumption that ancient cultures used naturalistic imagery. Unfortunately, the Egyptians did not do what today's alternative historians want them to do. There is not a single naturalistic picture known from Egypt. Every single painting, fresco or relief found in tombs or tempels are compositions. Compositions following a standardised canon. All the elements in these compositions are taken from a pool of standard elements like from a letter case. These elements are naturalistic, like the famous geese of Dahschur, but the whole picture is not a scene seen in nature but a composition of standard elements. The canon was so strict that it is often possible to construct large reliefs only from a few found broken pieces. These compositions naturally use components known by the Egyptians – they were enhancements to the writings always in or around such images. The reliefs in the crypts of Dendera are almost no exception. Almost because these reliefs show real, existing objects, relics used for religious cults, shrines. But these shrines were compositions which were replicated in the reliefs. Unfortunately, the surrounding hieroglyphic texts of the reliefs cannot be seen on the pictures used in the book. These texts could explain what the artist wanted to show. Words to speak by Ihi, the great, the son of Hathor, the lordly child of the eye of Re: “I have pleased your heart with splendour for your figure and I have driven away the rage with spells. Krassa and Habeck are telling their readers that the mysterious Ihi mentioned here is the light bulb itself. Over the next 1 ½ pages they use other text fragments to support this. So they claim, that Ihi is the symbol for a new beginning and it could be, like the eye of Re, an object. On the following pages they call Ihi consequently only “lamp object”. This cannot be true. In the RÄRG te authors listed as source is a large chapter about Ihi – and it is not an object. Ihi is a young man with a systrum (musical instrument like a rattle) in his hand, the patron and protector of singers and musicians, native in Dendera and part of any festivity. But there is no young man with a systrum in the picture above, so where is he? Well, NOWHERE in this part of the relief. As I explain later, Krassa & Habeck are mixing together texts from different parts of this crypta. The northern wall alone shows eight different scenes, each one had a separate shrine. The scene with Ihi is on the far eft, the first scene after entering the room, whereas the lamp is the third-last scene far on the right. Below you see a photo of the complete lamp-scene with Ihi on the left. It is sad that Krassa and Habeck come to the conclusion, that Ihi is a light bulb, although they had literature at hand explaining what to look for in identifying Ihi. Since Ihi is not a lamp but the person on the left, all the speculations on the following pages, needing Ihi as a light bulb, are worthless. Also, like many colleagues of their trade, the authors demonstrate that they have not the slightest knowledge about the topic they are writing about. So they claim that the quoed passage above shows, that someone is talking to or about Ihi, someone “has driven away the anger with spells” - so that the technical operators could handle the Ihi-bulb without danger. Unfortunately the construct “Words to speak by” starts a personal speech. Noone speaks to or about Ihi, Ihi himself tells that he has driven away the anger – something he hardly could do if he were a light bulb. Krassa and Habeck are making this mistake over and over, obliterating all their conclusions drawn from this. 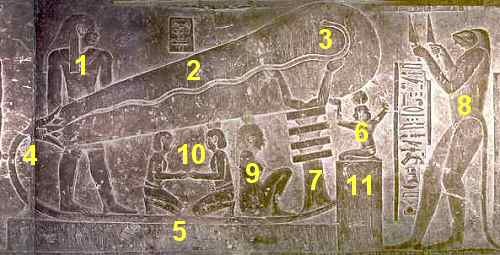 Their following speculation about “the son of Re” being the glow of the new lit lamp falls flat on its back because they do not know that “son of Re” is just a paraphrase for the Pharaoh himself. More interesting is how they interpret “Harsomtus”, a name appearing everywhere in the texts. Let's have a look at some negligibilities I noticed along the way. Krassa/Habeck are enraged (like many of their colleagues) by the interpretation of things as "symbolic" in scientific publications. Disgusting. The ancient astronaut hypothesis is much more straight forward, they need no symbolic hogwash to explain things. Well, aside, of course, of the symbols Krassa/Habeck also need to explain their construction! Yes, they need symbols too. The snake for example. The Garn-lamp has either a light aura around the arms or the light fills out the whole bulb. A snake as continuous effect does not exist. So the snake suddenly becomes a symbol for the electric current! But it even gets better: not only the snake, but all of the objects on the relief suddenly become symbols - the only way the authors can interpret away unsuitable "details". The two facing persons below the bulb are transforming to a "symbol for alternating current", the woman before them becomes a "symbol for electric current", the ape with the two knifes (identified only a few pages earlier correctly as protection god Upu, but with a crazy interpretation) mutates within a few pages from a "symbol for high voltage" to "Thot, bringer of light" - a "symbol for light". That's really funny, because Egyptology needs fewer symbols to explain the whole scenery, as I will show on the following pages. The lamp idea fails again since it needs not less but more symbols. So what about the disgust for symbols? Are some more equal than others? This is very unusual for alternative historians, normally completely outdated publications are used. Early translations like Budge are often vague and leave much room for speculation. Bonnet, p. 321 f "Ihi"